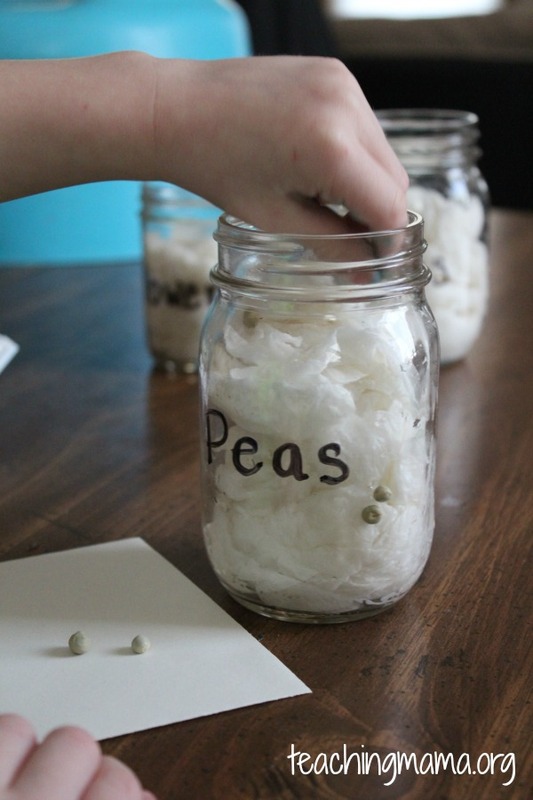 I am so excited to share with you a super simple activity that is awesome for teaching kids about seeds! 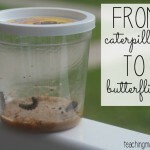 I did this germination activity with my preschoolers and they loved it. To start out, fill a jar with wet paper towels. Make sure to ring out the paper towels so there’s not excess water in the jar. Then place seeds in the jar, near the bottom half of the jar. If you do multiple seeds, label the jars. Then place them by the window and wait. After a couple days, you will see them start to sprout! After about a week, they will really start to grow! 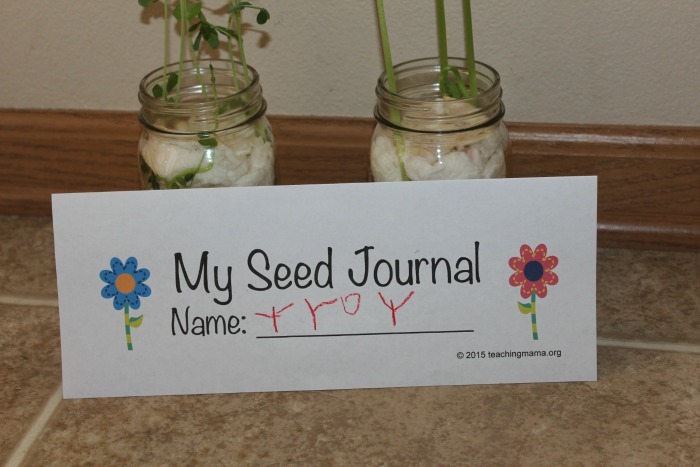 We tracked the growth of the seed with a journal. 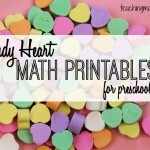 (The printable is found at the bottom of this post.) 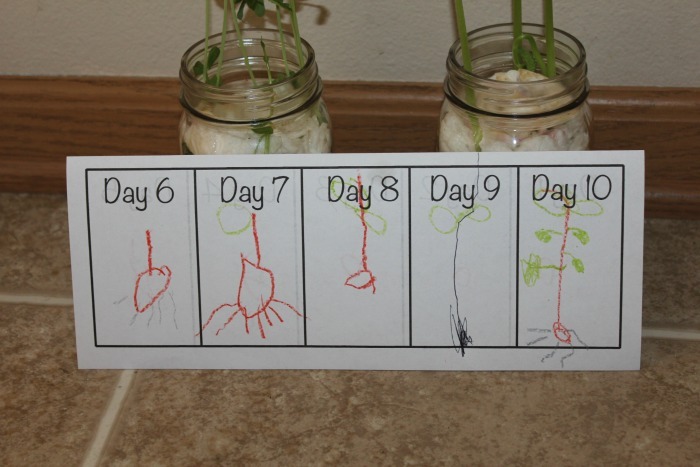 The journal has 10 days to draw a picture of the seed growing. We’ve had ours growing for about 16 days and they now look like this! So fun to see them grow so tall and to see the beans and peas start to grow on the plant. The flower plant was definitely slower to grow, but the seeds were also much smaller. 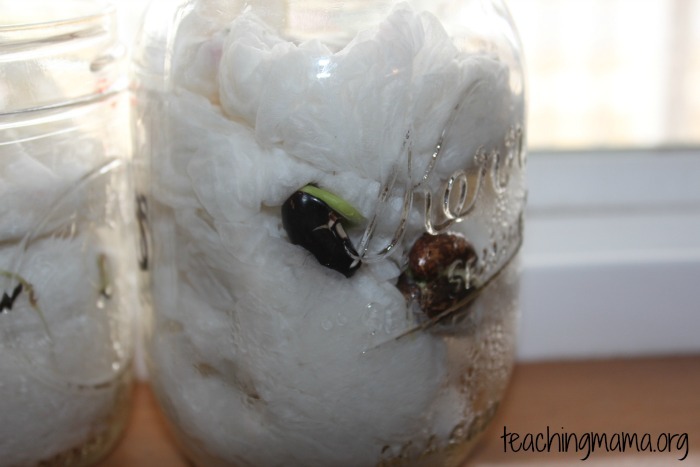 It was so fun watching the seeds grow in our window. To put the journal together, simply print the first page. Then flip over the page and print the second page on the back. Then fold the page horizontally. 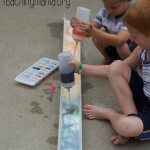 Fizzy Experiment – In a Gutter! Thank you! I just printed out the journal for my kids. They are so excited to get started. What a wonderful idea! 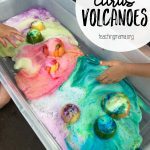 I will be doing this with my kids this week! Hey! 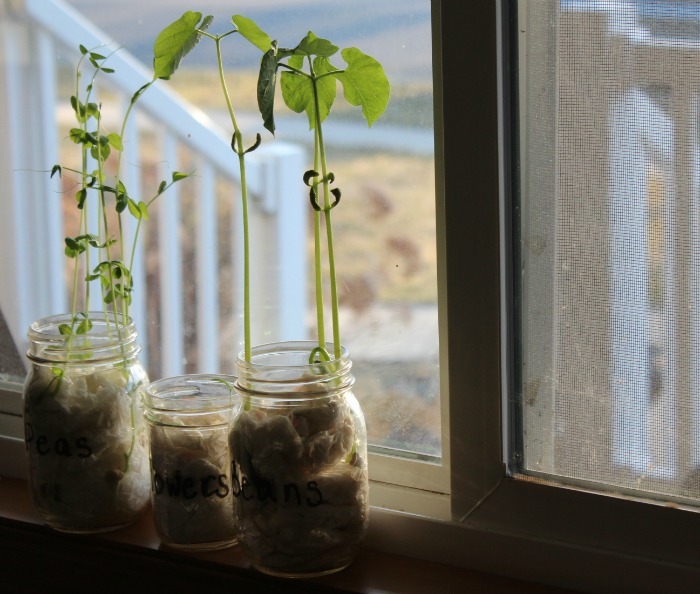 This may be a silly question… but how are they able to grow without nutrients from soil? That’s a good question! The seeds are able to grow from the sunlight and water, but they only lasted for about three weeks before they started to wither and die. I believe it’s because they weren’t in soil that they died. 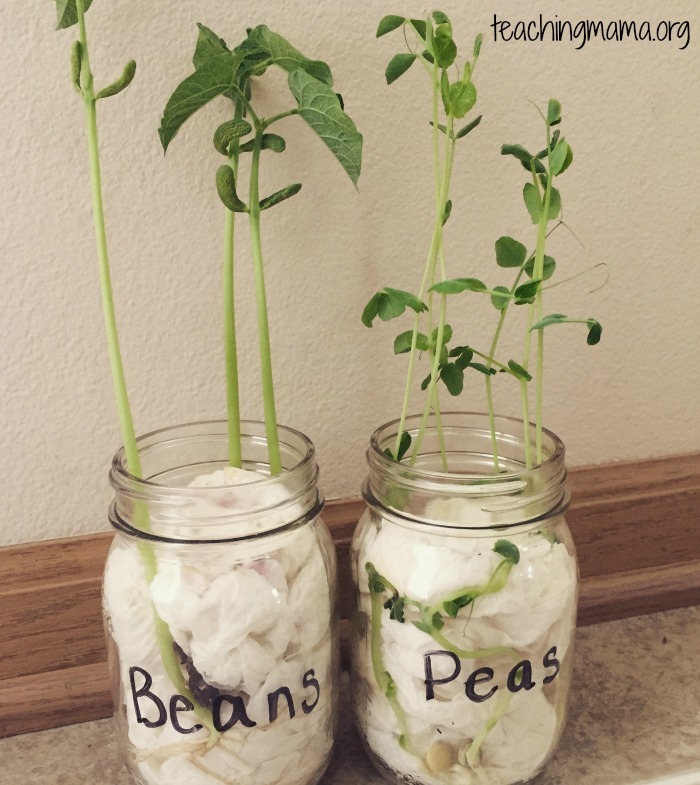 I’m not a scientist, but that’s just my guess 🙂 This activity is a way to show kids how seeds begin to grow. 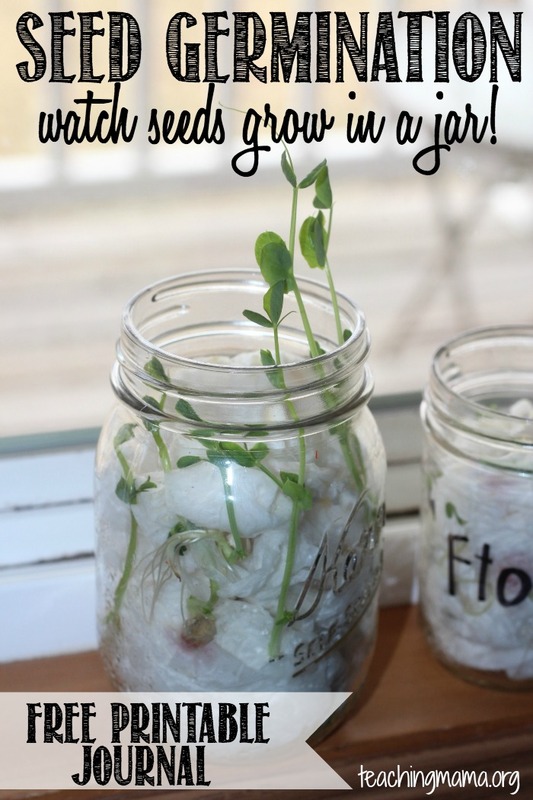 I’m guessing you could transfer the seeds to soil after they’ve started in the jar. Hope that helps! Seeds contain nutrients (stored food) for the germination process, but need soil to continue to grow after it uses up the stored “food”. Do I need to add water to paper towels regularly? What type of water did you use? 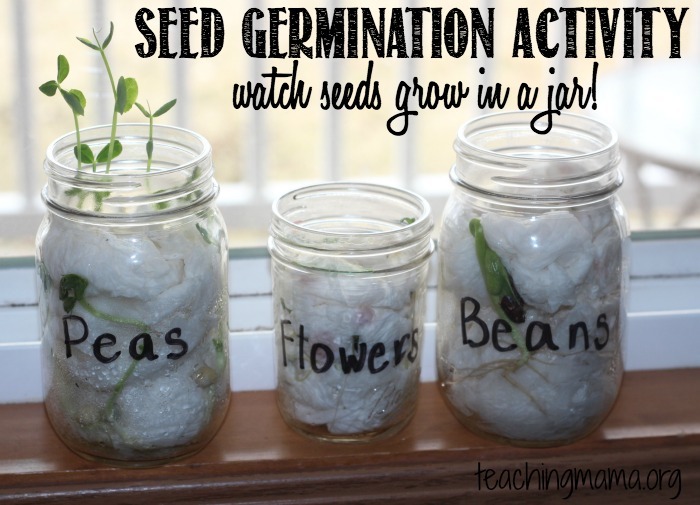 Many thanks for sharing your germination activity. I have been about ways in which my Y2 children could simply and regularly record the changes in their seeds over a couple of weeks and your seed journal is just perfect for them to do this independently. You have saved me time! Hey! I love this…just wondering exactly what type of seed you used? I used peas, flowers, and beans. I don’t remember which brand, but I think it was from The Dollar Tree. 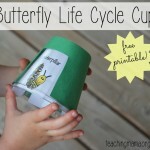 thanks a lot for sharing, definitely will try with my little one. Hi … do you have an example of a completed journal for the bean in jar experiment for comparison reasons? I’m sorry, but I don’t! 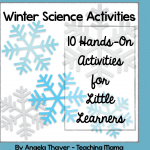 I can try to take a picture of it when we do it next!